Now I don’t expect most people to understand what I’m doing, or why I left a good part-time job to devote more time to the vagaries of selling old things, but I was really surprised at her condescending attitude. I think we’ve all experienced this. The few well-chosen words that are barbs. The tone. The gestures. The questions that are barely concealed criticisms/mockery of some choice we’ve made. Ha, but instead of making me feel bad/stupid/loser-ish (as I’m guessing was her intent), I felt good!! 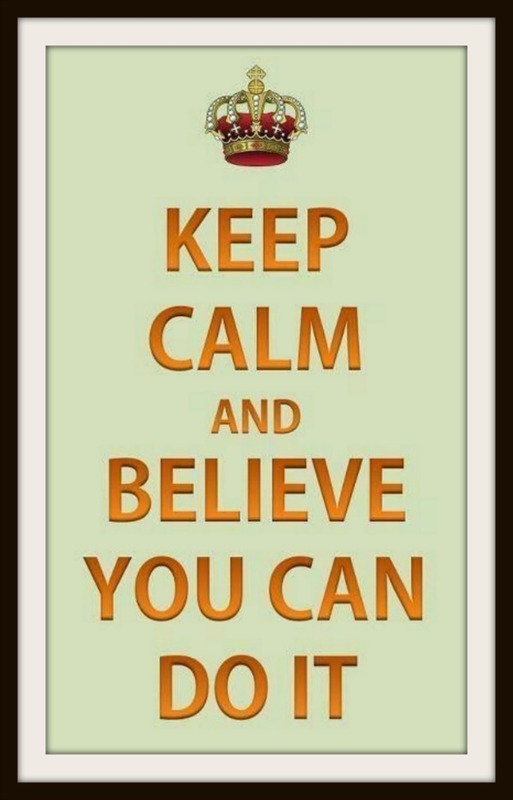 Nine months ago when I quit my job, I believed I could do this and I am! I’m living one of my dreams…finding lovely vintage things and selling them. As you can imagine, I didn’t spend much time talking with her. I wasn’t rude, but I don’t have time for people like this. You don’t either. Life is too short! 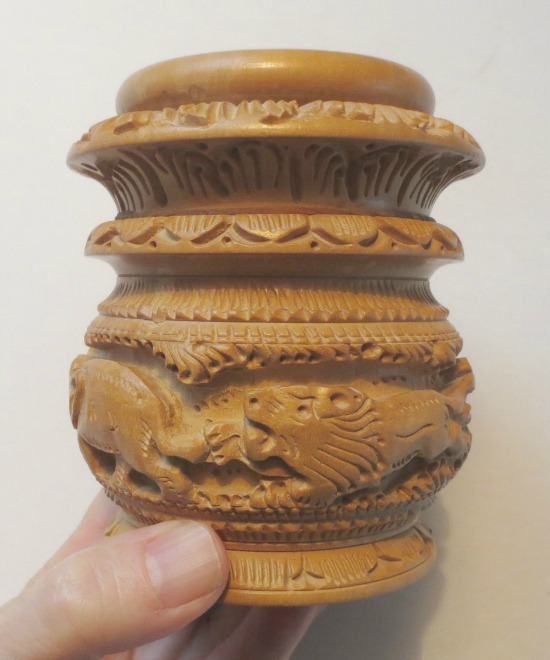 Don’t you love this intricately carved pencil cup? I’m guessing it was made in Africa or India based on the animals. There’s a nice weight to this honey-colored wood. 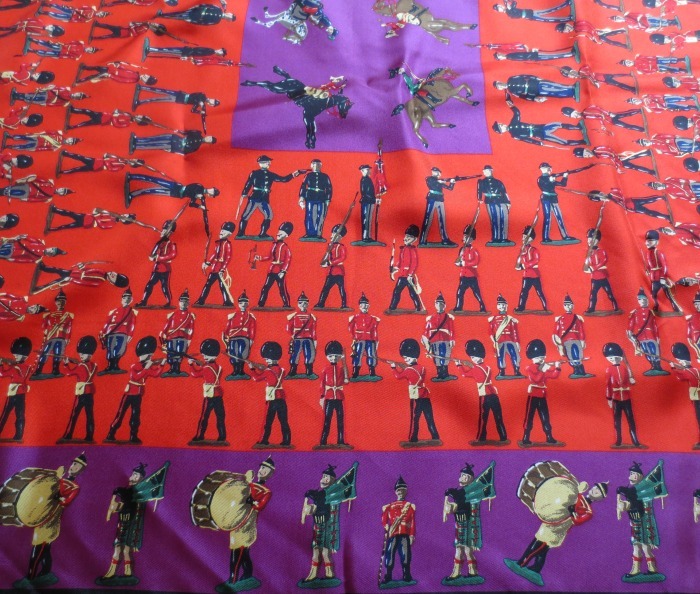 I might have a hard time selling this quirky Perry Ellis silk scarf in red and purple with English and Scottish toy soldiers because I love it! And so far I haven’t found another like it for sale online. 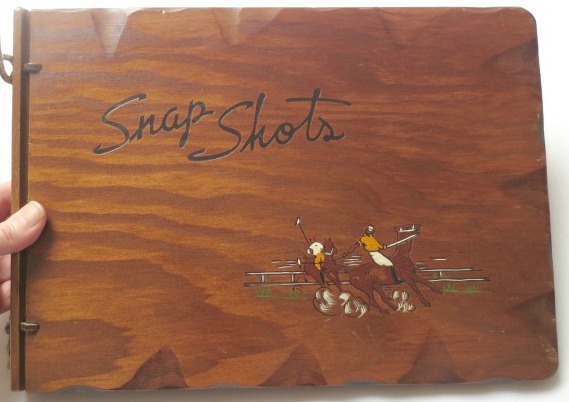 At my favorite dingy thrift store I found this 1930s wood snap shots photo album buried under tons of picture frames. Took me a few minutes to unearth it! It has polo players painted on the front and original pages inside. Other than a few light scratches, it’s in darn, good condition. 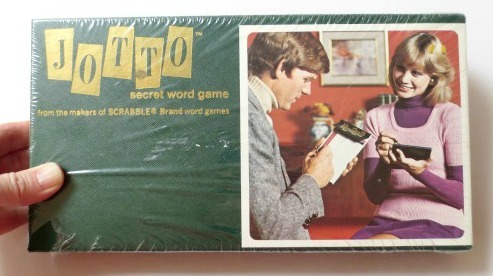 And who’s ever heard of the 1972 game “Jotto, Secret Word Game”?? Not me, that’s for sure, but I couldn’t resist buying this still sealed (!!) version. Found these old beauties on eBay. 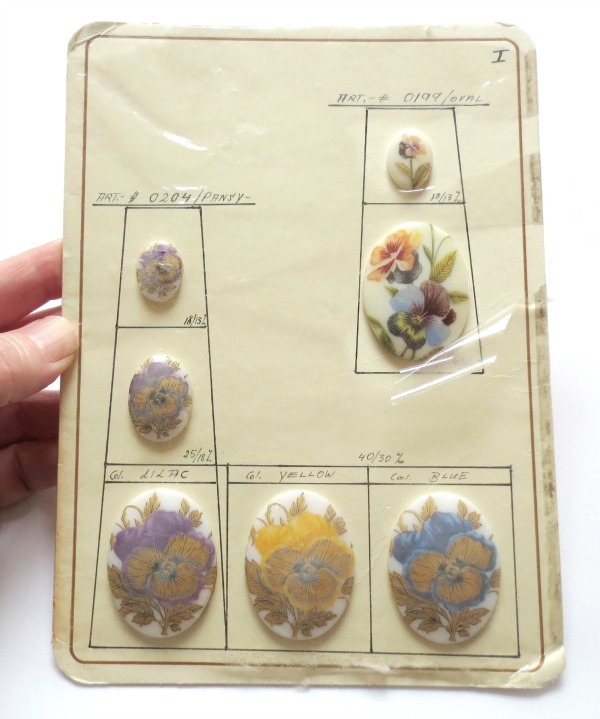 They are German (Otto Feix) porcelain jewelry inserts. Jewelry makers would turn them into pins and such. The package still has a bit of its original cellophane wrapping. So that’s a few of my recent finds. Hope it’s all happy hunting for you too!